The individually numbered motorcycles – the first-ever production vehicles to feature Jack Daniel’s livery – became available for purchase on March 4. Created to commemorate the 150th anniversary of the Jack Daniel Distillery, which was registered in 1866, these special models were produced in extremely limited numbers that did not exceed 150 total units. Of the 149 units sold, 97 were purchased by customers in the U.S. and 38 found a home with international customers. The final unsold unit, #1 of the limited edition series, an Indian Chief Vintage version that was the custom painted prototype built by Klock Werks, will be auctioned at Barrett-Jackson Las Vegas on October 6-8 at the Mandalay Bay resort, with all monies from the auction benefitting Operation Ride Home. More information can be found at Barrett-Jackson.com and JDOperationRideHome.com. Designed in conjunction with Brian Klock and his inspired team at Klock Werks in Mitchell, S.D., the Limited Edition Jack Daniel’s Indian Springfield and Chief Vintage models both feature an array of genuine Indian Motorcycle accessories and custom accessories, as well as Jack Daniel’s-inspired custom paint and logos, badging, leather saddle and saddlebags. Each fender is inscribed with the names of the seven Master Distillers who have overseen the Jack Daniel’s distilling process over its 150-year history, and an inscription of Jack Daniel’s “Bottles and Throttles Don’t Mix” mantra reminds riders that drinking and riding are meant to be enjoyed separately. 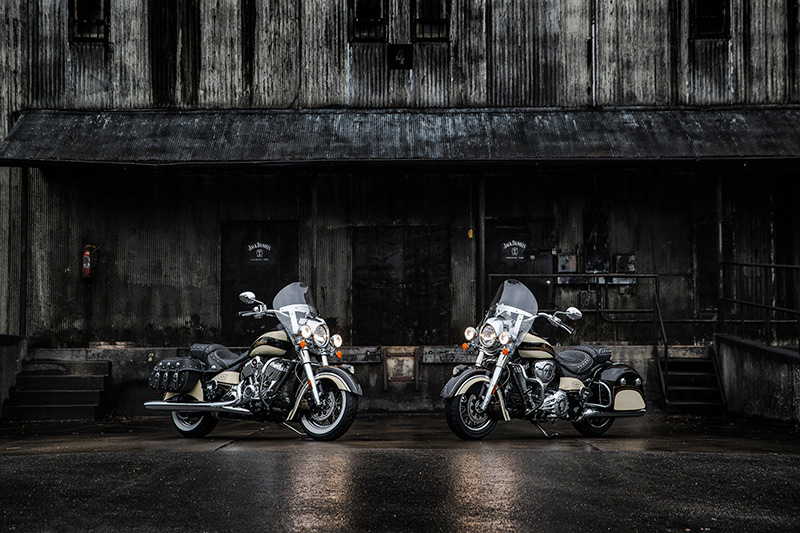 Both models also come with a custom-printed Jack Daniel’s whiskey barrel top to commemorate each bike, a two-year unlimited mileage factory warranty and free membership in the Indian Motorcycle Riders Group™ for one year. Each motorcycle will be hand-painted and built, with delivery occurring no later than August 2016. For more information about Operation Ride Home, or to make a tax-deductible donation, please visit JDOperationRideHome.com. Jack Daniel’s press information can be found at the Jack Daniel’s press room located at www.jdpressroom.com. Learn more about Indian Motorcycle and the 2016 Limited Edition Jack Daniel’s Indian Springfield and Chief Vintage by visiting IndianMotorcycle.com.